One of the most amazing aspects of Siena's location is the incredible variation of its surrounding landscape. 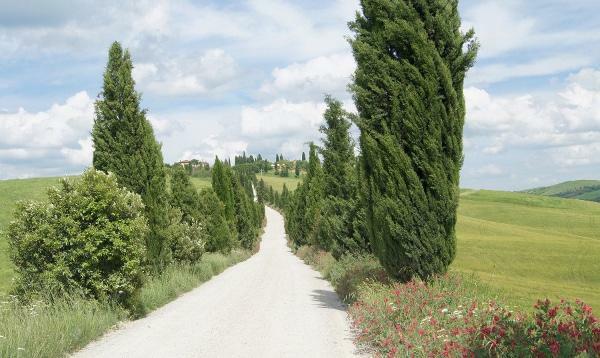 The Chianti area to the northeast is probably the most well-known zone, in which gently rolling hills host ancient manor homes and farms between neatly planted rows of olive trees, cypresses and grapevines. Towns such as San Gimignano (a medieval trading post) and Monteriggioni (built to protect the via Francigena) can be found there. To the southwest are the Colline Metallifere, metal-containing hills once mined by the Etruscans and to the southeast are the Crete Senesi, the clay cliffs and harsh rock formations that resemble a lunar landscape. There is little vegetation in the Crete but thanks to irrigation works, grain and sunflowers can now be grown there. This is also the region of white truffles, the medieval thermal baths at Bagno Vignoni and the beautifully frescoed convent of Monte Oliveto Maggiore. Siena's ancient holdings extended west to what is known as the Maremma district on the coast of the Ligurian Sea. Today many Sienese, attracted by the sun, sand, water, and nightlife of the former fishing villages turned trendy beach spots, have second homes in this area. One particularly quaint and popular beachtown is Castiglione della Pescaia.